For routine extracts of metabolites from a variety of biologic samples. Metabolite extraction protocols often require low-temperature conditions, to minimize degradation of the metabolites. To create an automated solution for metabolite extraction, MéCour to customized a HAMILTON Starlet robot to include deck positions chilled to -80° degrees Celsius. The HAMILTON/ MéCour unit maintains temperature consistently and for long operating periods. The unit includes features that prevent condensation and therefore maintain a working environment that is ideally suited for our metabolite extraction methods. Automating this workflow is a challenging task that has already begun to deliver significant value. 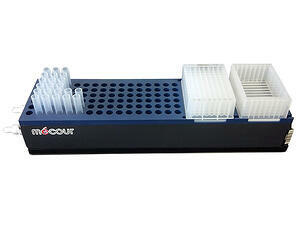 The Hamilton STAR line workstations are based on superior air displacement pipetting technology. This increases accuracy and repeatability while providing chain of custody with pipette condition monitoring and recording. Each workstation can be configured with multiple arms and each arm can be configured with multiple pipetting and labware gripping devices. Pipetting channels and labware grippers move independently of each other, supporting the use of a wide range of labware. The autoload option provides barcode tracking of samples, labware, racks and carriers. All workstation functions and integrated third-party devices are controlled by the Venus software. Thermal unit designed to accommodate a variety of tubes, a reservoir and DWP. All of these consumables are maintained at the same exact temperature, providing end user with maximum flexibility and use of consumables without compromising temperature integrity.